As an educator, I watched my students struggle with nonfiction texts, namely newspaper literacy. Though my ambition was to make my students secular-minded world scholars, the interpretation of current event articles traditionally proved to be an overwhelming assignment for them. The language was over their heads or the content of the story was framed in an inaccessible way to children. Parents would often call to tell me how frustrated the assignment made their children. If they weren’t already tired of scouring the Internet looking for a particular news story, then they were spending hours deconstructing the story. Newspaper literacy is an essential skill. Without it, we are not setting our kids up to truly understand what is happening in the world or how they fit into it. Nevertheless, my experience with my students is undeniable proof that our kids need more support in this endeavor; they need one place to turn to, a way to compensate for journalistic language that they may not grasp yet, and a set of specific questions to anchor their understanding in the content of the story. Recently, the W.O.R.D Ink team found such a place and it’s appropriately called Newsela. Newsela.com, short for News English Language Arts, is a website created by a team of educators, journalists, and technologists who work collaboratively to publish high-interest news articles daily from reputable newspapers and journals. Not only does Newsela offer the same article at varying reading levels, they provide follow-up reading comprehension quizzes that are already aligned to Common Core standards. It’s Free: All you have to do is register as a teacher or parent, create a username and password, and respond to a welcome email. Paperless and Easy to Navigate: Everything is online, and you or your student can alter your account to suit your needs. Teachers can set up accounts for different classes and parents can set up accounts for their children. When your students take quizzes online based on the articles they’ve read, you can see how they did—what questions they knew the answer to and which ones they need help with. Nonfiction literacy: With routine use of Newsela, students are constantly getting exposure to nonfiction texts – the genre of text that is foundational to math, science, history, and English. A Trustworthy Resource: The website is updated daily, adapting articles from such reputable journals as The Washington Tribune, The Associated Press, Returners, and the Los Angeles Times. The website is also international in scope and has made brave moves to feature articles on controversial issues like feminism in the Middle East, discrimination across race and gender lines in the United States, human rights violations overseas, and gun-control policies in the wake of American tragedies. In the Spirit of the Common Core: Since the adoption of the Common Core Initiative throughout American education systems, students are being asked to apply critical thinking skills to primarily informational, nonfiction texts in order to build their vocabulary, background knowledge, and college-readiness. Not only does Newsela offer students a vast array of high-interest nonfiction texts, the website specifically aligns a huge amount of articles with specific common-core standards, giving our students an objective even before they start reading. The anchor image means that the article is aligned with a Common Core standard. It also means that there is a quiz available on this particular article. Everyone is Using It: Newsela was just awarded a $1.2 million seed round by NewSchools Venture Fund. Matthew Gross, the co-founder and CEO of Newsela, shared that the website has approximately 400 teachers and 3,000 students registering every day. Teaches Computer Literacy: When students are reading articles, navigating lexile levels, and taking quizzes assigned to them, they are building their computer literacy — one of the most essential skills to their future success in academia and the workplace. Mirrors the Same Aesthetic as Newspapers: The website is aesthetically similar to other online news publications. By using the website, we are potentially creating life-long learners – a generation of people who are both familiar with online publications and have the skills to understand and evaluate current events. Engaging: With high-interest stories ranging from subjects like law, science, money, war, kids, and human interest, Newsela offers literary content that is engaging to kids by virtue of its relevance. Ownership: Kids create their own online profiles and are responsible for both reading assigned articles and taking assessments. Keeping up with classmates necessitates a self-motivation and can potentially instill a culture of respect and ownership. Newsela is an incredible resource. It’s efficient, accessible, and responds to the varying needs in our diverse classrooms. 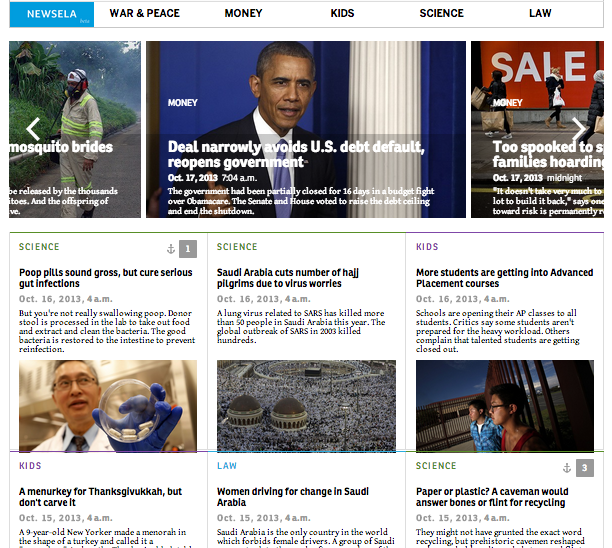 Not only does it expose students to events, personalities, and mindsets outside of their immediate environment, Newsela strives to make global news accessible. Because the website pulls articles from a variety of different publications, it saves us research time. Also, students have their own accounts, are responsible for their own assignments, and can easily navigate the website, essentially challenging them to drive their own development. Moreover, students aren’t bogged down trying to simply comprehend the articles, they are engaging with them — they are answering questions and analyzing themes and perspectives. By building computer literacy, educational ownership, and overall awareness, Newsela is a tool that parents and educators can use to instill a culture of empowered and informed learning for their students.